Before using your Berkey fluoride filter for the first time you must prime them. This is because the filtering media contained in the element is very dense and contains dust from the manufacturing process. Priming will break the surface tension of the filtering media. It will also flush the manufacturing dust from the media. Since the PF-2 fluoride elements will be hanging in the lower chamber where the filtered water is, the first step is to wash the PF-2 fluoride elements. To do this, leave the blue caps that came with the filter in place and wash each PF-2 fluoride element with water and a mild dish washing soap, then rinse. Using clean hands, remove both blue caps from each end of both filter elements. Place the tan coloured rubber priming button onto one end of a PF-2 and align the hole of the filter with the hole of the rubber washer. Next, press the priming button up against the faucet so that the rubber priming button creates seal between the faucet and the PF-2 element. 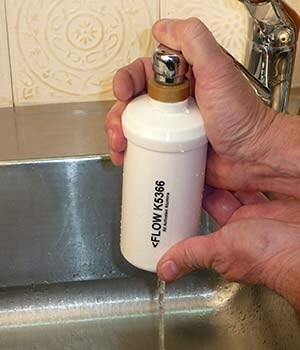 While holding the priming button against the faucet, turn on the cold water slowly. Hint: Placing your thumb on top of the faucet to apply pressure will create a better seal. The water will fill the cavity of the element and discharge from the opposite end. When this is happening, do not be surprised if the element begins to feel warm to the touch. This is a natural consequence of the water wetting the filtering media. You might also observe what appears to be “smoke’ coming out from the opposite end before the water begins to discharge from it. This is normal. Allow the water to flow for at least 30 seconds or until water runs clear, whichever is longer. Turn the PF-2 filter over and prime the opposite end (reversing the flow of water). Repeat step 2 until water runs cleans from both directions. Hint: To check whether the filters are flushed long enough, run some water that is being flushed through the filter into a clear glass and hold it up to the light to see if all of the cloudiness is gone from the water, if not continue priming until water is clear. Caution: When screwing the PF-2 element onto the Black Berkey filter stem, do not exceed 8 revolutions or the threaded portion of the filter will protrude too far into the fluoride filter and possibly damage the filter. When using the newly installed PF-2 elements for the first time, it is quite a common occurrence to find a fine white dust being deposited at the bottom of the lower chamber. In addition, some of this white dust may appear to be floating on the water surface – this will have the appearance like a very thin oily sheen. Or it may form a white ring around the lower chamber if the water is left standing in the lower chamber for some time. Thus it is recommended that after installing (or changing the PF-2 filters), the first two rounds of water from the filter should be discarded and the lower chamber be washed with a mild soap solution to remove the white powder deposits.